Page 22 is part of the sequence that introduces three main characters: The Blood of the Lamb Ministry (BotLM), Father Fischer, and Greg, a semi-reformed teen hustler. The BotLM building was based on a number of buildings and locations I photographed while researching the North Beach district. Father Fischer is based directly on the author, Andersen Gabrych, at his insistence. (I was more inclined to base Father Fischer on a middle aged Spencer Tracy). Greg is an adolescent version of James Dean. 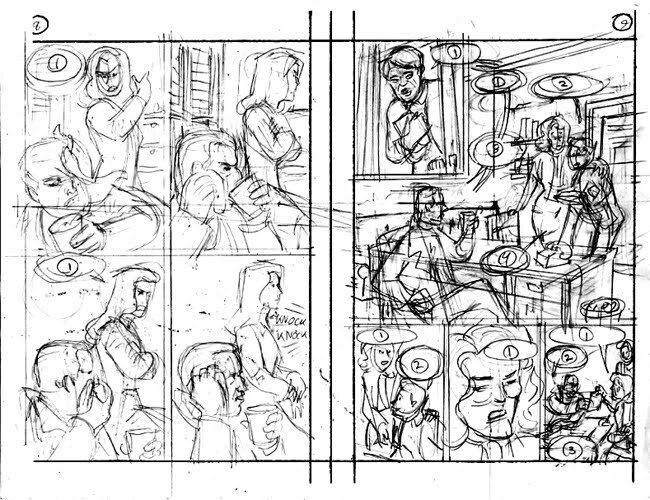 Andersen originally pitched Fogtown to DC/Vertigo as a 12 issue, regularly formatted mini-series, meaning that it would be 144 regular size pages, averaging six panels per page. They decided to publish the novel through their newly conceived Vertigo Crime imprint. This meant that it would be trimmed to 170 pages, averaging four panels per page. Much expositional information was lost, along with many establishing vistas of the city in transition. When I had to make a choice between the city and the human characters, I usually chose the humans. Also, the editorial mandate to limit the panel count to four per page sometimes had to be circumvented simply to convey the plot and emotional points Andersen and I were trying to make. Page 23 is a case in point; panels needed to be added simply to explain the characters and milieu. Page 23 is also exemplary of how my initial attempts to be gestural didn't serve the artwork. I avoided using a straightedge while inking the Sentinel building, resulting in a distractingly crude look. This was done before I started working with my assistant, Lee-Roy Stephen Lahey, and could assign the drawing of tedious detail to him. Page 23 introduces Bone, Frank's rough-trade paramour and (seen in silhouette in panel 8, through the windows of the Cadillac illegally parked next to the hydrant) Bone's boss, the civic reformer and secret crime boss, Colonel Rupert Thorpe. Page 12/13 will be used to explain the creative process for the graphic novel. First I'll show you the script, then the steps in turning it into graphic novel form. Loretta hands him the hanky. As he drinks the coffee. Loretta: Do it yourself then, tough guy. TENSE SILENCE as Loretta smokes and Frank wipes off his face. Loretta finally speaks, but doesn’t look at Frank. Loretta: You didn’t come home last night. A sudden KNOCK provides a relief for both and their heads turn toward the door. The door opens to reveal MAGDA, an adorable little middle-aged Mexican woman. She peaks wide-eyed around the door as she opens it. Frank stays seated. Loretta goes to welcome Magda in. Magda: I am Magda. I am look for my daughter. Carmen. Frank: Well, Magda. She ain’t here. Magda: No. No. She is go runaway. Magda looks up at Loretta. Loretta: Here, please sit down. Magda: Gracias. You are Senora Grissel? Loretta’s eyes turn to slits. Loretta: No. I’m just the secretary. Magda hands Frank a photograph. Magda: I bring photo. See? I adapted the script, roughing out each page on copy paper, rendering my concept of word balloon and blurb/display copy placement. I then copied both the editor and the writer for their suggestions/ mandates. Next is the first pass at finished art, done at the original, smaller size. Initially, I had been trying for a loose, gestural look. For instance, I opted not to use a straightedge while inking backgrounds, emulating cartoonists like Milton Caniff ("Terry and the Pirates", "Steve Canyon"), Jordi Bernet ("Torpedo 1936"), and Tony Salmons ("Vigilante", "The Strange Adventures of H.P. Lovecraft"). I discovered, working in the smaller format, that my results were more sloppily crude than successfully gestural. My editor, Bob Schreck, was also unhappy. We agreed that the remaining 100 pages would be done at the more traditional 14" x 9" size. This would achieve a tighter, slicker look. Bob had extensive revision notes on the first 70 pages. I elected to do the alterations in the larger 10" x 15" format and composite the fixes using Photoshop. I delivered the finished pages to DC via the Internet, uploading the finished files to DC’s FTP site. The production process for mainstream comics is typically an assembly line. One person executes the script, and then various other people provide the pencil artwork, the inked artwork, the lettering, and the coloring (or, in this case, the gray toning). The editor will assign the various chores as s/he feels fit; it’s rare that one artist or creator gets to do all of them on the same project. In this case, I was unhappy with the original lettering when Bob sent me the rough lettering pass, in early '09. I sent a detailed, page by page listing of all the mistakes and lapses in aesthetic judgment I saw. Bob left the project soon after and was replaced by the new editor, Will Dennis. Will sent me the pre-publication galley in early '10. All the elements of the lettering I had objected to were unchanged. I re-sent my critique to Will and he gave me permission to re-letter the display and SFX lettering (I didn’t have the time or ability to re-do the body (balloon) copy and had to let that go). I was not comfortable with Illustrator, the program of choice for letterers, so I hand lettered the re-dos and composited the fixes in Photoshop. Now comes the final step before publication, where any mistakes can be caught and last minute changes call be made. The galley was the first time I saw the gray tones, which were executed by Rivkah. Although she was chosen by the second editor on the book, Brandon Montclair, I was happy with her work. She was surprisingly sympathetic with what I was trying to achieve with lighting and mood, and even imitated my brush strokes, leading to a very seamless look. She also avoided glow effects, self-color lines and other excesses allowed too easily by the computer, for which I am extremely grateful. This page is an example of what I changed from the original lettering pass. The prostitute shown here is supposed to be 14 years old. I found it difficult to keep her looking teenaged in the relatively realistic style I was using. It might have been easier if I’d chosen a more cartoony style. 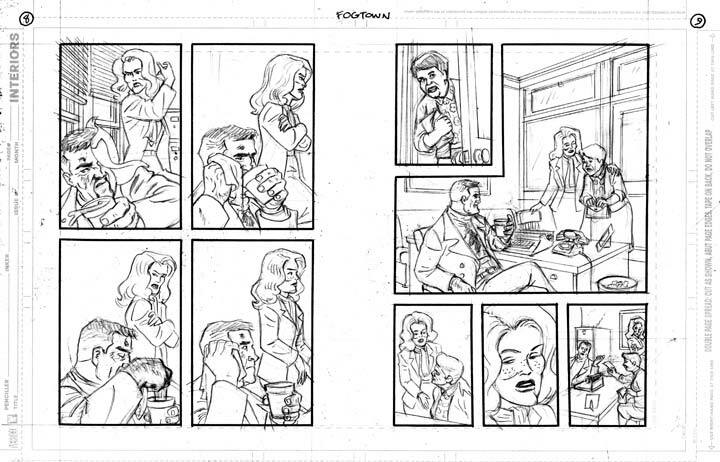 The first 70 pages of the graphic novel were done in the smaller 6" x 9", two images per 11" x 17" sheet of art paper. This was the format chosen by the publisher, DC Comics, for their new imprint, Vertigo Crime. These books are 8" x 5 3/8". Comic books are traditionally 10 1/4" x 6 3/4" or 11" x 8 1/2". The original art for this larger format tends to be one 15" x 10" image on each 17" x 11" sheet of art paper. The smaller format for the original art was chosen because of the smaller size of the published work. These images are from the graphic novel Fogtown written by Andersen Gabrych with art by me, Brad Rader, published by Vertigo/DC. Copyright 2010 by Andersen Gabrych and Brad Rader. Fogtown is available from Amazon. CELEBRATING THE RELEASE OF THE GRAPHIC NOVEL "FOGTOWN" PUBLISHED BY VERTIGO/DC -- STORY BY ANDERSEN GABRYCH, ART BY YOURS TRULY! collaboration between Bob, Lee-Roy and myself. Images are from the graphic novel Fogtown copyright 2010 by Andersen Gabrych and Brad Rader. Fogtown is available from Amazon. I'm tabling at the PRISM Comics Booth at Comic Con this year. Come check me out. Fellow graphic artist and CAPS member, Jim Wheelock is trying to raise $ for his graphic-novel-in-development, "Inferno 2010". He's using kickstarter.com, a cool site for this purpose. I donated $40 to the cause; he bought a copy of my self-pubb'd graphic novel, "Harry and Dickless Tom" last year. Plus, I've seen the work in progress; it looks pretty cool. Tonight I "met" Rivkah, the artist who did the gray tones for my upcoming graphic novel, "Fogtown". I googled her name; there are tons of "Rivkahs" on the web; luckily her site was the first. All I knew about her , courtesy of Will Dennis the third editor on the book (following in the abortive footsteps of Bob Schreck and Brandon Montclair) is that she was a woman and does manga. Her blog archive mentioned nothing of working on the book, which was perplexing given that she blogs often and at length. Yet what are the odds that there is more than one single named female cartoonist who does manga? So I emailed her last night, and got her reply this evening. In tonight's reply, I told her about my upcoming exhibition of the original artwork at Flazh! Alley Studio. I'm in the process of writing placards to go up next to each piece. This is what I wrote about Rivkah on the appropriate placard: "She was Bob Schreck’s choice, not mine but I’m happy with her work. She was surprisingly sympathetic with what I was trying to achieve with lighting and mood. She even imitated my brush strokes, leading to a very seamless look. She also avoided glow effects, self-color lines and other excesses allowed too easily by Photoshop, for which I am unbelievably grateful." (However, she informed me that Brandon Montclair picked her, not Bob. Hats off to Brandon for an excellent choice).